Oh no! Ugh, now you need to reboot your computer and… same thing, over and over. Turns out, Google Chrome had an update over the weekend that patched some stuff but they also somehow managed to update their embedded flash to a newer version than even Adobe Flash offers. Odd. Thanks to Reddit user /u/theVelement for posting the (hopefully temporary) fix. Just navigate to %USERPROFILE%\AppData\Local\Google\Chrome\User Data\PepperFlash in Windows and you should see a folder called 27.0.0.170 – this is the new Flash distribution. You should also see a folder called 27.0.0.159 and all you have to do is deleted the 27.0.0.170 folder and be on your way. Some people have had to copy the contents from 27.0.0.159 into 27.0.0.170 and have had success that way. However, I did not have 27.0.0.159 at all! Anywhere! Work PCs, home PCs, lab VMs, nothing! Fortunately I was chatting to /u/Icarusfixius in Discord and we were lamenting over the issue. He was nice enough to shoot me his 27.0.0.159 directory since I have no traces of it over here, and boom! All back to normal (I hope)! So, if you’re in a position where you don’t have the “older” 27.0.0.159 folder, I am hosting it here for you to download. The filename is 27.0.0.170.zip but it’s got the earlier versions contents inside. Of course your mileage may vary etc. etc. but maybe this will help others in the future. Good luck! 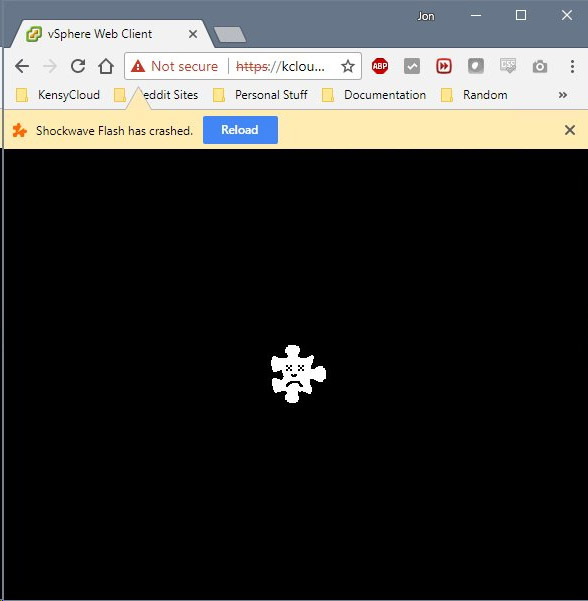 VMware published a KB article titled Shockwave Flash crashes with vSphere Web Client 6. Thanks !! It works just great ! Hi ! I tried to connect to vSphere but I cant connect. I only have the folder of the last version help!!!! THANK-YOU! I struggled with this for hours! Really bad decision by VMware to put someone else’s product in front of their own. Especially now that support for the windows client is no more, any browser bug/feature could now keep you from your infrastructure. I know HTML 5 is there too but is that going to be any less prone to surprise security updates or new features that knock out the web client. You are my hero! Thanks for the post and I to didn’t have any other version so double thanks for posting the DL link! it just keeps updating to the broken version for me and none of the ways to disable chrome updating are working either, very annoying, having to use firefox with older version of flash for now. Bill – delete the contents of the 27.0.0.170 folder but not the folder itself. Then, drop the contents of 27.0.0.159 into the .170 folder (or use the contents shared in the link/post above). Should work for you! I tried that and then I just get a grey screen and with the broken puzzle piece.. on the other hand the Mac fix worked for me, any news on a permanent fix? Apparently the update was put out because of some zero-day vulnerability.. supposedly..
Just to follow up, I worked on this again yesterday and what did work was to replace the whole folder… just putting the contents in the existing folder -it kept updating. Didn’t work for me. Also, IE crashes as well. The original bad directory always comes back. The problem is then back and the directory has to be deleted again. Is there anyway to stop chrome from recreating the bad flash directory? Hey Jeffrey – keep the directory but put the contents of 27.0.0.159 in it and it should work continuously. Awesome – so glad you found it useful! Scroll down, download, extract and install. Each package has all the possible releases (Mac, Windows, Linux, etc). Good to know though do you know if it creates the PepperFlash directory and such that Chrome wants? I did try installing standalone earlier Flash versions but without success. Thanks for the suggestion! Thanks Jon. This worked for me. Like Vince, I spent a lot of time trying to figure this out without any luck. Nice work. Glad you’re sorted out – I can’t take all the credit as the bulk of discovery was done by user /u/theVelement but its the community that makes solutions available! THANK YOU!! I has resorted to IE and kinda felt icky using it lol. Literally LOL’d on this one – I know what you mean! Argh I am sorry I should have published this sooner. I too wasted a number of hours so hopefully you don’t feel bad.